Researchers at the Photonic Systems Group, Tyndall National Institute and the Department of Physics, University College Cork, have developed a novel hybrid full-field detection electronic dispersion compensation (EDC) scheme for use in an optical communication system. Hybridisation of complementary dispersion compensation methods, each optimized within predetermined limits, enables this technique to support longer transmission distances, better performance, and/or faster-adaptation speed than what would be possible for EDCs implemented individually. Extraction of both the optical amplitude and instantaneous frequency using a passive asymmetric Mach Zehnder interferometer and direct detection photodiodes further improves the performance beyond conventional direct-detection EDC methods. Trials have demonstrated 10 Gb/s transmission over 900 km with broad chromatic dispersion range and residual fiber length uncertainty. This work is undergoing patent application and was funded by Enterprise Ireland and the European Commission National Development Plan. The technique uses an asymmetric Mach-Zehnder interferometer and inexpensive direct detectors to extract both the optical amplitude and instantaneous frequency information. This information is used to reconstruct the full-field representation of the distorted signal. In a first stage of EDC, the reconstructed distorted signal is processed, and coarse chromatic dispersion and static system impairments are compensated by a cost-effective dispersive transmission line with parameters updated at a selected rate. In a second stage, refined dispersion and system impairments are provided by an adaptive electronic equalization circuit with parameters updated at a faster rate than those in the dispersive transmission line. Each step in the process provides control feedback to the preceding steps, thereby significantly reducing sensitivity to system variabilities. Hybrid full field EDC presents many important technical and commercial advantages over established optical and electronic based detection and compensation schemes respectively. Some summary features are highlighted in the tables below. Superior power and spectral efficiency compared to on/off keying (OOK). Does not require full-field construction in the electrical domain. Complex optical implementation including narrow-linewidth optical laser, 90 degree hybrid etc, and additional polarisation and phase stabalisation. Use passive AMZI and inexpensive direct detectors to obtain the optical full field similar to coherent detection, therefore reduce overall receiver costs, reconstructed full field improves the performance beyond conventional DD EDC and also facilitates the use of dispersive transmission line. Dispersive transmission line or frequency domain equalization Low complexity and cost-effective, especially for long-distance transmission or large dispersion values. Low adaptation speed, can only be used in full-field or coherent detection based EDC, relatively poorer performance. Fast adaption to fibre link conditions and excellent dispersion compensation within limits. MLSE complexity increases exponentially with compensated dispersion value. Practically this limits MLSE to 500 km transmission at 10 Gb/s. Only optimum when noise statistics of MLSE samples are uncorrelated. Typically requires whitening. 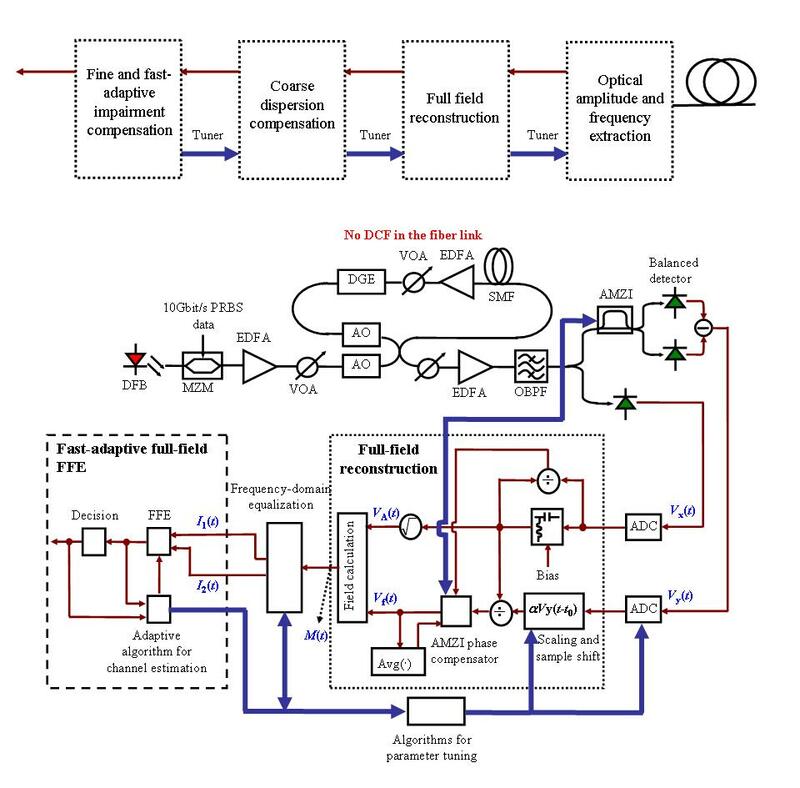 Hybrid full-field EDC provides a low-cost method for extending the reach of 10 Gb/s or 40 Gb/s transmissions over single mode fiber beyond the limitations of conventional direct detection EDC methods. Conceivably the responsiveness of the fast adaptive full-field stage renders this technique amenable to packet switched networks. Patent Application "Electronic Dispersion Compensation Systems and Method"